Asha Khemka was always certain that one day she would be “somebody”, but she says there was never a plan. However, determination and success appear to be in the Khemka family genes. At the tender age of 33, her grandfather became the youngest judge to ever be appointed in the Indian state of Bihar, before becoming the second most senior judge of the Supreme Court. And even husband Shankar is a consultant orthopaedic surgeon at Queen’s Hospital, Burton on Trent. However, it was not until Khemka’s arrival in the UK in the winter of 1978 that she found her independence and the meteoric rise through the FE ranks to damehood would begin. 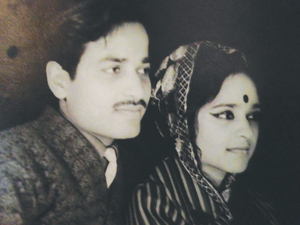 Born to a wealthy upper class family in one of the poorest Indian states, Bihar, from a young age Khemka’s life was planned for her and there were strict customs and traditions to follow. Her marriage was arranged and at 14, just two years after the death of her mother, she was a wife with all the expectations of running a household. “Around the age of 13 I recall lots of proposals coming through for a marriage,” explains Khemka. “Then one day all of a sudden I found myself at my aunt’s house. ‘I am going to put a sari on you,’ she said. ‘Why? I said. “Suddenly my husband’s family arrived, except for him, and were showering me with jewellery and I was engaged — just like that. “It was not for about another eight or nine months that I finally met my husband. Our romance developed over time, through writing to each other initially. Shankar was a young medical student when they first married in India. It was the offer to undertake his Fellowship of the Royal College Surgeons that saw the family including three young children, move to the UK. “Honestly, when I arrived, my worries were: ‘Can I speak a proper sentence in English? Can I communicate with people? Can I own a car? Can I learn to drive? Can I learn to swim? Will I be able to take my children to playschool and other places on my own?’,” explains Khemka. “We arrived on January 31, 1978, with three very young children, [sons] Sneh, Sheel and [daughter] Shalini, all of whom were ill during the flight, so it was an exhausting trip. “I remember my first morning waking up and looking out of the window. There was snow. It all felt very strange — a shock. I was in an unrecognisable land with a limited grasp of the English language. 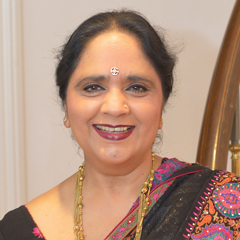 “I used to regularly fall over on the ice while wearing my saris and flip-flops. It was not long before we went shopping and bought more practical clothing. “I started to learn English by watching children’s programmes, cartoons, speaking to mothers in the playschool and making a point of speaking with my children in English at home — things started to come naturally. “Our plan was to go back to India after Shankar had completed the fellowship. But Britain had given me my independence and the space to grow. After running the family household for two decades and with all three children having settled at their boarding schools, Khemka wanted a career. “I found myself at home thinking ‘What am I going to do now? I have to do something.’ So I enrolled myself on a course and I did a secretarial course to become my husband’s secretary,” she says. “But while studying, I was being told: ‘You can do this, you can do that, you could be very good at this…’ So I took teaching qualifications. It was her confidence to walk in to the local college in Oswestry and demand to speak with the principal that helped her land her first teaching job. Over the following years Khemka rose through the ranks, impressing her managers with her ‘problem solving skills’. Her roles ranged from deputy head of school to a part-time Ofsted Inspector. And following several failed applications to become a principal, Khemka spent two years at New College Nottingham as deputy principal. It would be a further six applications before Khemka landed the top job. “I arrived at West Nottinghamshire College and immediately felt: ‘This is my college.’ There were five other candidates, all deputy principals from large colleges, and two other candidates for this job said to me: ‘You are hungry for this job, aren’t you?’,” she says. It was a determination that she concedes may have given the wrong impression. “I have never regarded myself as a people person,” explains Khemka. “I was always seen to be an ambitious individual, driven, clear, single-minded, focused, wanting to achieve something regardless. Her recent recognition in the New Year Honours list seemed unreachable when she arrived in 1978 and it comes after receiving an OBE in 2009. And our interview paused on numerous occasions, interrupted either by a call from a well-wisher or for another media interview. “The damehood is a big thing,” says Khemka. “It’s the achievement of generations. It’s not my achievement. The way this honour is going to be regarded, it’s not my achievement alone; it is the achievement of the family. It was inspiring to “meet” this extraordinary – and extremely attractive – woman who is apparently the mother of the the much admired radio doctor,Sneh Khemka. One wonders who is more proud of whom- mother or son! And congratulations to the lady on being honoured with an OBE.